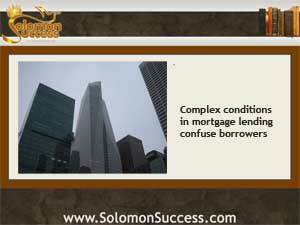 Solomon Success > Blog > Why Do Lenders Say Yes – Or No? Why Do Lenders Say Yes – Or No? One of the essential principles of prosperous living, as King Solomon tells us in his Proverbs is equity – dealing fairly and evenhandedly with others. But in the complex and confusing world of mortgage lending today, equity seems nowhere to be found, as lenders accept – or deny – loan applicants for reasons that aren’t always clear. One of those newly established standards is the Qualified Mortgage Rule, aimed at protecting loan applicants and lenders from future defaults. The QR Rule is a federal guideline arising out of the Dodd Frank Act, and it establishes a set of minimum lending criteria intended to screen out risky borrowers and lower the possibility of defaults and foreclosures. Research a bank’s loan products through its promotional materials, online information and even a personal chat with a representative. But expert warn that when “interviewing” mortgage lenders, it’s wise not to undergo a credit check unless you’re seriously considering making the loan, since too many credit checks can affect credit scores.